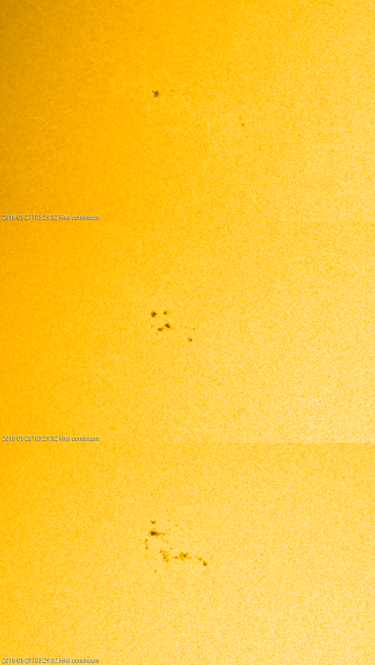 Last week, active region NOAA 2712 rounded the east limb. It announced its presence well in advance, as dynamic coronal loops were towering above the east limb more than 2 days before the sunspot group actually became visible. The extreme ultraviolet (EUV) image from SDO/AIA underneath shows the coronal structures above NOAA 2172 on 23 May at 12:20UT. The image has been rotated over 90 degrees, with east on top. The related movie covers the period from 21-25 May. The region produced several B-class flares, as well as one C2 flare, which peaked on 23 May at 18:21UT. The SDO white light image underneath shows the region at that moment, with only the bright facula field from its leading portion visible. 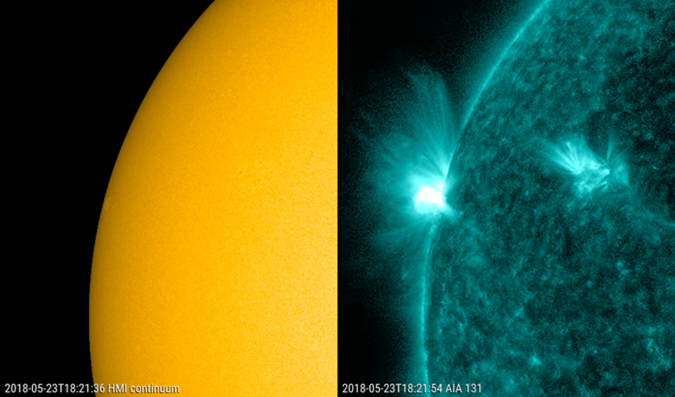 On the right is the SDO/AIA 131 image in EUV showing the flare in progress at the same time. The movie covers the timeframe 17:30-18:30UT. As the region had rotated over the east limb, it became clear that this was all in all a simple and decaying sunspot group. 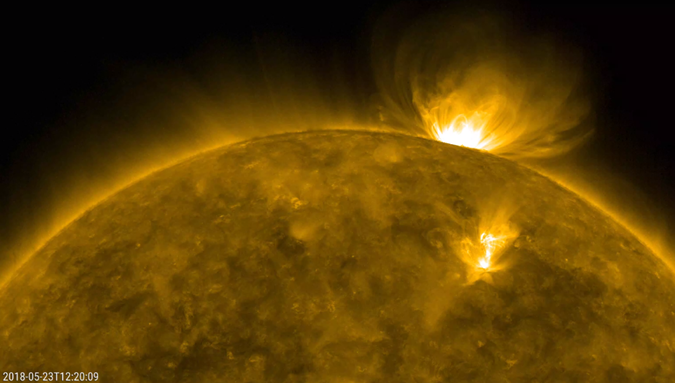 However, the region did not want to end its career so soon, and it renewed the magnetic flux emergence during the afternoon of 27 May, resulting in an increase of the number of sunspots. As there was also some mixed polarity involved in its trailing portion, NOAA 2172 produced even a C2.7 flare on 28 May at 17:10UT. The evolution of the sunspot group in white light from 27 till 29 May can be seen in the SDO/HMI images underneath. It is followed by a zoomed out animation, showing that the region was still not very big in size. The animations were created with JHelioviewer.